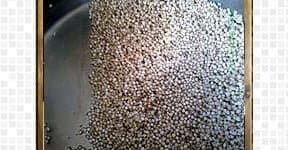 “Quinoa” wiki calls this as the super grain because of its high protein content compared that of any other cereals. This grain is rich in protein when compared to brown rice, potatoes and also a great source of dietary fiber and phosphorous. Here is the recipe for protein rich, fiber rich, healthy Quinoa salad. If an ingredient has more healthy factors, everyone starts talking about and comes up with customization. 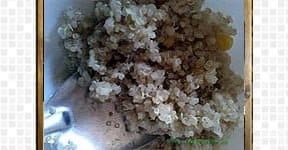 After reading the goodness of quinoa everywhere, right from the magazines to the Television healthy Shows, I started including this grain wherever I could. I have already come up Quinoa Dosa here. Quinoa grains are easier to be handled with, like rice. To get fluffier yet softer grains, keep the grains boil for 5 minutes and then keep in simmer flame for 15 minutes by covered. Use the fork to stir and fluff them up. 1. Wash quinoa in the running water. Use the strainer or tiny holed colander for washing. These grains are tiny, handle them gently. 2. In the higher flame, keep a vessel and add 1¼ cup of water and salt. Bring it to boil. Add washed and cleaned grains. Allow it to boil for 5 minutes. Then keep in simmer flame, cover the lid and allow them to cook for 15 minutes. By lifting the lid and stirring occasionally. After 15 minutes, it should have absorbed the water and cooked completely well. 3. The well-cooked grain will get smashed in the fingers when pressed. Using the fork, gently separate them from sticking. 4. In the microwave safe bowl, add frozen corn,peas, and salt. Cook it for 2 minutes or until they become softer. Thinly slice the avocados. 5. In the salad bowl, add cooked Quinoa, corn kernels, peas. Add few drops of lemon juice.Use wooden ladle or fork to gently mix them. Transfer Quinoa Salad to the serving bowl, add a topping with avocado slices. This grain is rich in protein when compared to brown rice, potatoes and also a great source of dietary fiber and phosphorous. 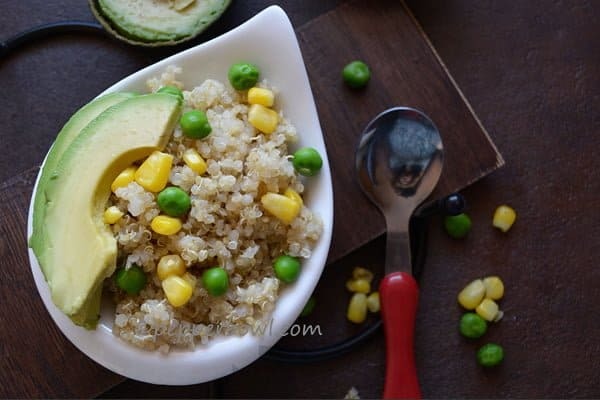 Here is the recipe for protein rich, fiber rich, healthy Quinoa salad. 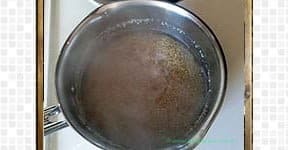 Wash quinoa in the running water. Use the strainer or tiny holed colander for washing. These grains are tiny, handle them gently. In the higher flame, keep a vessel and add 1¼ cup of water and salt. Bring it to boil. Add washed and cleaned grains. Allow it to boil for 5 minutes. Then keep in simmer flame, cover the lid and allow them to cook for 15 minutes. By lifting the lid and stirring occasionally. After 15 minutes, it should have absorbed the water and cooked completely well. The well-cooked grain will get smashed in the fingers when pressed. Using the fork, gently separate them from sticking. 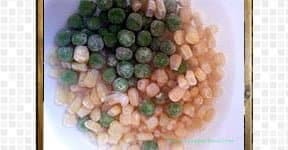 In the microwave safe bowl, add frozen corn,peas, and salt. Cook it for 2 minutes or until they become softer. Thinly slice the avocados. In the salad bowl, add cooked Quinoa, corn kernels, peas. Add few drops of lemon juice.Use wooden ladle or fork to gently mix them. 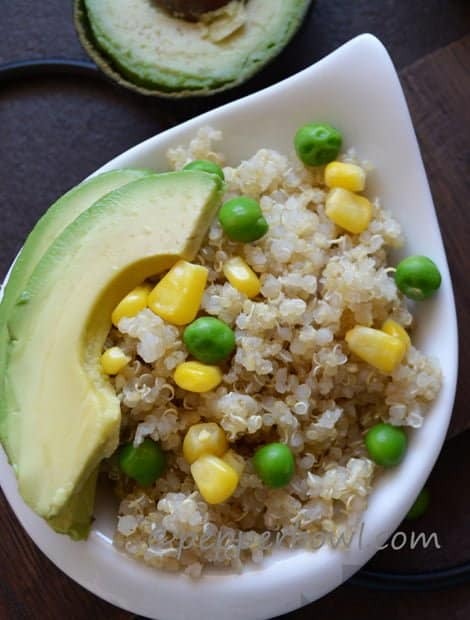 Transfer Quinoa Salad to the serving bowl, add a topping with avocado slices. Serve them as breakfast or as a side salad to the regular meal. I love to have this recipe for my lunch, whenever I am in dieting mood. Substitute lemon juices any other healthy salad dressing of your choice. Apple cider vinegar would bring out different taste to the salad. Add any other fresh vegetables of your choice. Do not forget to look into other salad recipes like, Grilled Pineapple Salad.